Hi there. That photo is from one of our many walks this past year. And I put it there to set the tone. I'm not going to revisit last year's list of intentions for a number of reasons. Let's just say things got a little bit away from me. My own cookbook project about the farmers' markets has been on the back burner because I needed to get my house in order. And because I did not have a whole lot of energy in 2013 to devote to that back burner. Basically, awakening to my own mission and spiritual growth sort of took over almost everything in 2013, giving me more information about myself, illuminating my past and therefore my path. Last year was all about trust, starting right in January, when I lost the most valuable jewelry a married woman owns inside the gearshift of my car, and going all the way through, seeing what I saw, hearing what I heard, putting all of these messages together. We got it out, but little did I know it was setting the tone for the entire year's lesson: TRUST. But here's what I'm thinking, for 2014. It's going to be a year of major shifts for many reasons; first of all, John and I are both hitting a milestone birthday in March. 1. Let's just say that I'm still planning on getting that farmers' market cookbook out there. The motivation has ebbed and flowed in the past year. The definition of the project itself is up in the air; so is the idea of self-publishing vs. someone else legit doing it for me. I am going to investigate all options. But the one thing I learned? If you want something done, you have to do it yourself. 2. And that I would like to receive at least a level 1 Reiki attunement. 3. And that I would like to go through yoga teacher training in the fall. 4. And I would like to go to the IACP conference in March (That's International Association of Culinary Professionals). Check! Christmas present! (Thank you!) I think that's the biggest thing. I'm trying not to have high expectations and just take it all in, but people network like crazy at this thing and I need to plan now for what I'm doing there because it's a big scene. Mostly, I feel like every time I turn around I'm going to stumble into someone I deeply admire and turn into a puddle of geeky-fan-girl-goo who can't. stop. talking or totally clams up. Intimidating and exciting at the same time. But maybe it's not supposed to be a brand. Maybe it's supposed to be a company name. I don't know. I assume I knew, when I came up with it, but we are not totally in control of our ideas here, people. Let's just face it. 6. There may be another cookbook project on the horizon. That one hasn't been discussed in a while, and it's not for public consumption just yet. It is still an idea. All of these things require enormous pushes—really, it feels like moving boulders—to get past personal hurdles and the recurring narrative of negativity that we all have on some level. Mine has been taking up too much real estate lately and is far too loud. (Also, I realize that I may have inherited these behaviors; have you read about epigenetics?) Two smart yoginis I admire greatly recently put it this way: "My inner party pooper gets way too loud sometimes," (amen, Alicia!) and "I decided to rewrite my narrative," (I'm trying, right there with you, Susan!) I am paraphrasing them, and I'm sure I didn't get it 100 percent right, but you get the idea. How do I balance my inner pusher, the one who wants to just keep going and doing and feels like what I'm doing is never good enough or just enough, period, with the inner critic who fears judgment and failure and says, "Are you crazy? You don't have enough time, money, resources, talent, blog posts, etc. to get this thing published! Why bother?" I think I have to silence them both and boot them, for good. How? That's a day to day thing. Some days are easier than others. Today is not one of them. So you see, my list is short this year, shorter than last year. But it's full of Really. Big. Things. I am not unique in this world to say I love my family. I love my husband more than words can express; we go way back and understand each other better than anyone else. I am grateful that my children are happy and healthy and in a place where they receive excellent care and education. To that end, I love Michaelene Parks, their teacher, and Third Street Alliance. I can't say I always love the challenges my children present sometimes, but I am grateful for what they have taught me about myself thus far, and themselves. And I love my parents: they are the first experience we have with love, and damn, they gave me and my sister and good one. My mother had the biggest heart of anyone I've ever met. Look what happened, by accident--or not! 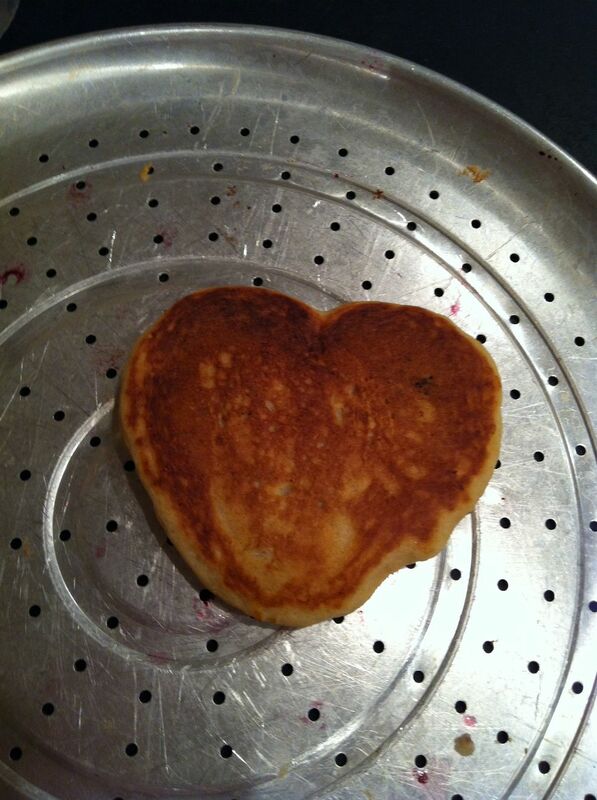 Heart pancake. I love all the people who are, as I like to say, "on my team:" those dear souls whose experiences right now are all dovetailing into one big spiritual soup of change. I think of my sister, whose own path so closely aligns with my own--we are truly each other's biggest cheerleaders right now, I think. I'm grateful she has found an awesome job where her big boss applesauce buys the staffers a Vitamix and tells everyone to not eat lunch at their desk. (Go HuffPost!) I'm endlessly grateful toward my friend Jessica, who is a shining beacon of light and love. Thanks for clearing the pathways and for sharing your gifts with all of us. (Please buy one of her awesome vibration-raising t-shirts.) I have gratitude toward every single yoga teacher I've ever taken a class with, past and present; you've all informed me, shaped me, helped me, challenged me, encouraged me, laughed with me. We are on this path together, people. I love my work, even as the definition of "work" is shifting. It all involves food and writing and travel in some regard. I love the time I have spent as a travel writer with Frommers. I suspect it's not totally over yet, but it's shifting for now. I love the people. I am so grateful for those opportunities. I learned today that someone in my new "work" (Beth) knows someone from my old "work" (Stephen). Love those synchronicities! I cherish the encounters, the people I continue to meet as a result of following food love. To that end, I love all of the hilarious people at the Cosmic Cup for the community building that place creates, and the opportunities it provides. I love Warm Sugar and Artisan's Kitchen Project--a new place that's selling my baked goods. I love the food writers I've met in the past year, too. I can't believe the generosity of spirit of those who have offered their advice and insights and help. It seems that the culinary community really understands karma. Or maybe because there is just so much love when it comes to good food, that the professional world of food is necessarily, happily, not like most other working communities. Whatever the case is, I'll take it. I love my doctors and healers and all those who look after my health and that of so many others. I love my holistic, crazy-smart, nutritionally-savvy chiropractor and his entire staff (yay Dr. Smith); I love my primary doc and my ob-gyn for being so proactive and full of common sense. I love my pediatrician because he helped center me when I first met him and was crying in his office, while pregnant, just weeks after my mother passed away. The compassion he exhibited was more than I expected and just what was needed. We looked no further. I love the fact that his office calls our house the morning after one of our kids is there for a visit, to check up on how Miles or Desmond is feeling. I am grateful toward my friends, and yes, even grateful for Facebook, because it gives me such small glimpses into the very busy and interesting lives of very old friends from high school (even when it means there's a Facebook fast! ), whether that's someone's art work, someone's dinner, something funny someone's child said, or just a random observation or memory. I am grateful that it shows me how similar we all are, at the end of the day, despite whatever has come between us--time, space, memories, silly disputes, or what have you. I am grateful for the serendipity it has permitted in terms of our ability to connect with people we don't quite know well. I am grateful for what social media has brought me in terms of work, community building opportunities, and the ability to share things that I love, and talk about them. What's the point of it all if you can't share? Speaking of social media, it's enabling me to hear about the progress of pregnancies right now, of friends who are near and far. I'm so grateful. Jim and Lisa, you will be awesome parents. There is going to be a ton of laughter in your new place in Sleepy Hollow/Tarrytown/literary New York State scary-ville. I can't wait to visit you with cupcakes and cookies and our boys and see how your little girl is experiencing the world. I love that John and I will be able to share our experiences with twin parenting with such dear friends, Jim and Kate, who are facing the arrival of twins in a couple of months. It's a huge gift, sharing the ups and downs of twin pregnancies and twin raising. We don't go through tough times for nothing. If we can't help each other, lean on each other, laugh about stuff and cry about stuff, then what's the point? Finally, I love Easton. I love the people. I love the architecture. I am evangelical about the Farmers' Market. But if you know me, you know this already, and it's well-expressed elsewhere. I know there is much more I am missing, forgetting. But you know I love you, so it's all good, right? PS: Did you get my Simpsons reference in the headline? You can argue semantics about resolutions vs. plans, goals, or what have you. Making a resolutions seems to have more to do with the cessation of something—smoking, drinking, eating sugar—rather than the initiation or start of something. Last year I covered my take on the language issues and set forth my food resolutions. And of course, they were more than food resolutions—they were life-altering resolutions. For 2013, I'm just calling them intentions, because that's what they are. I had a very powerful experience last year when I did this. Most of them happened, and many of them in ways I could not have predicted. Here's one of them: puff pastry. Apple turnovers, part of my kitchen to-do list. It was a year of synchronicities. Now, here's the harder part: continuing the momentum needed to make things happen. And just trusting it will. First and foremost, though, I want to express my gratitude toward the various people I've come in contact with in the past year whose guidance and friendship have confirmed that I'm on the right path—there are too many of you to name, but you know who you are. I started writing a cookbook, got derailed when I started testing recipes for someone else's cookbook (thanks, Dave! ), and then we went away and the holidays came. I met some amazing people in the Lehigh Valley who are doing beautiful work with food, and some of those relationships continue to be rewarding (hello, the teams at Molinari's and Two Rivers, among others). And toward the end of the year, capping it off, I was asked to serve as a judge at Lehigh Valley Harvest, which I blogged about. It was a delicious honor! Fitting with the New Year's theme, Tuesday morning's yoga class was about shutting off the negative self-talk, and instead, telling yourself you can do it, that you are perfectly good enough to do what you need to do. I don't want to get too terribly introspective here, but in the past couple of years, the change in self-identification has brought with it lots of fun times but also its fair share of doubt and inertia. It's also brought about the need for incredible, unwavering focus, which is often challenging for numerous reasons (have you met my boys?). This year, I'm admittedly having a little bit harder time with January and this list. The stakes are higher; I suddenly have time on my hands that I didn't have before, and holes in my income I didn't have before, to match. No one seems to know what will happen to Frommers.com; the last bit of the laid-off web editors are now all officially laid off, as of December 31. It's bittersweet. I hope to continue to do work with them in a new, Google-owned incarnation, but nothing is clear at the moment. Ok......enough preamble. Here we go! 1. Write a formal proposal for my Lehigh Valley Farmers' Cookbook. It ain't going nowhere without that. 2. Go (with proposal) to the IACP conference in San Francisco. Self-publishing is likely the end result, and not necessarily a bad one, but I want to put it out there before self-publishing is confirmed. 3. Continue to explore cuisines and dishes I haven't done much with (hello, curry! ), and cook with one unfamiliar item or cuisine every other week. This was on last year's list, but it was fun and I want it to continue. 4. Integrate all three of my sites: this one, the Lehigh Valley Farmers Market site, and Nostalgia Baking. It's all me, but I don't know how to integrate these, technically speaking; I'd need development and design help for certain. I don't know which is the "brand"? (I'm kind of laughing at the word.) Maybe it's just my namesake site, which seems most logical. 5. Start producing more of my own content: i.e., take those integrated projects and aspects of my work and do more of my own blogging, become something resembling my own media outlet. I'm not going to stress and worry about how to find readers, but there won't be readers unless there is regular content. 6. Find new outlets for writing about food and travel. I'm going to stop at six, because this list is smaller but more difficult than last year's. These need to be manageable tasks. I'm just going to hope that I can work toward it and that the right people will appear (and the right circumstances will emerge), in order to facilitate these big changes. There are other intentions I want to set, mostly of a spiritual nature, but I won't go into that here. Those things, I'm just going to let them evolve on and off the mat. They make all of this possible. How about you? 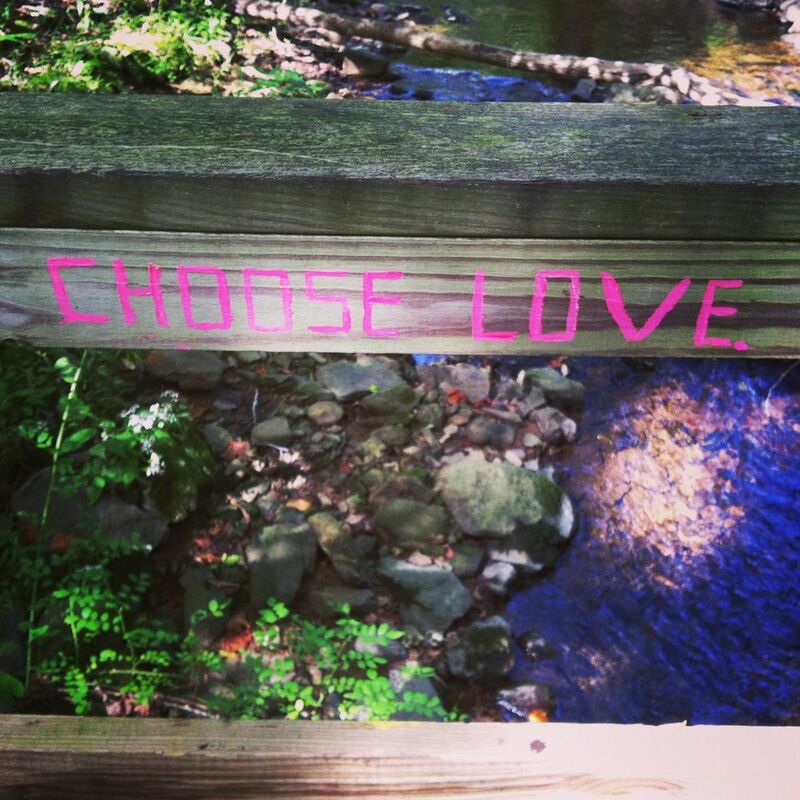 Do you have any big plans, goals, intentions, resolutions, for 2013? Don't underestimate the power of a clean slate. It's harder to be optimistic, so much easier to be cynical. Anything is possible, always.